Attach this Butterfly Breast Cancer Key Chain to your keys as a reminder of your courage and strength to fight breast cancer. 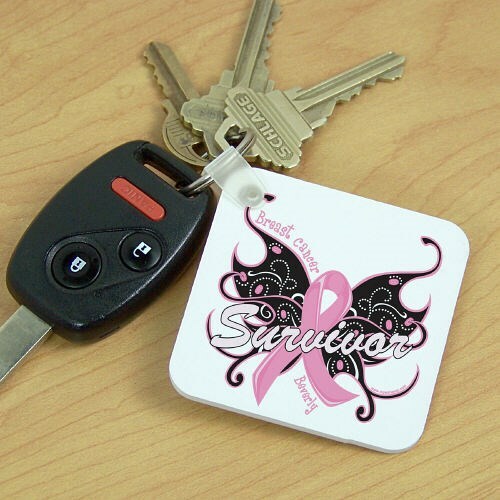 Our unique Breast Cancer Survivor Key Chain makes a perfect and fun awareness gift for any survivor you know. By showing awareness, you will help support Breast Cancer and also help fund research for a cure. Be sure to also promote awareness with any of our Personalized Breast Cancer Awareness Gifts. Also, view our Butterfly Breast Cancer Survivor Tote Bag and our Butterfly Breast Cancer Survivor Long Sleeve Shirt as well. Feel good knowing that for every purchase made, MyWalkGear.com will donate a portion of the proceeds to help find a cure.